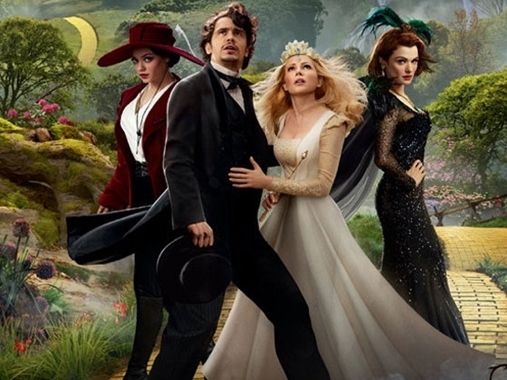 Oz the Great and Powerful is about a man who captivates audiences with his tricks and illusions, immersing them in a world where magic and fantasy are as real as anything else. Just as Martin Scorsese’s Hugo used robots and machinery as an allegory for filmmaking, I can’t help but see a connection between James Franco’s Oz and the film’s director, Sam Raimi, getting a captive audience to, even if only for two hours, believe in this world of witches, spells, and flying monkeys. While it could never possibly stack up to the film that inspired it, and it suffers from some serious miscasting, Great and Powerful is a perfectly satisfying prequel, and a surprisingly well-constructed piece of family entertainment. Set before the events of the 1939 classic, Oscar Diggs (James Franco), nicknamed Oz, is a supposed all-powerful magician in a traveling circus. In reality he’s a con man, lying to his audience and the people around him, revealed early on when he’s unable to help a young crippled girl walk. After the townspeople discover the kind of man he really is, Oz flies away in his hot air balloon, and is sucked straight into a twister which sends him flying through the air, from his boring, black and white world into the wonderful, colorful, magical land of Oz. He’s greeted by Theodora (Mila Kunis), a witch who believes he may be the great man the people of Oz have been waiting for. The Wizard of Oz was one of the earliest examples of visual spectacle in movie history. Practically every scene was designed to show off the elaborate sets and beautiful Technicolor filmmaking. The same can be said of Oz the Great and Powerful. Where as the original Wizard showed off the magic of color, this film shows off the magic of 3D and computer effects. The imagery is absolutely gorgeous, benefited greatly by the use of 3D, which makes this feel essentially like a feature length Disney theme park attraction. The integration of real actors and special effects is also rather impressive. Occasionally the sets and locations look a bit fake, lacking the reality and grit of practical locations. But characters like Finley (Zack Braff), a flying monkey who becomes Oz’s companion and China Girl (Joey King), a walking, talking figurine made of porcelain, are entirely computer animated, and they interact with the real actors in a seamless fashion. The original Wizard of Oz story also had plenty of heart to it in addition to the spectacle. Likewise, Great and Powerful’s storyline is a bit meatier than you might anticipate, as long as you keep in mind that you’re watching a PG Disney blockbuster, here. This is a simple story intended for kids and families, but then the original film was, too. It’s ultimately a classic hero’s journey about a man’s rise to greatness, which is somewhat predictable but works perfectly fine for a piece of family entertainment. The screenplay, by Mitchell Kapner and David Lindsay-Abaire, won’t win any Oscars, but it does its job. James Franco is fine as Oz, but I can’t help but question his casting and wonder if there aren’t plenty of other actors who would have been far more qualified. When he’s asked to appear out of his element, thrown into this crazy situation with no idea what’s going on, Franco definitely pulls it off. But I simply didn’t buy him as a man who people would believe is a great wizard, because he’s never quite charismatic enough. Another actor like Robert Downey Jr., who was originally cast as Oz, would have been far more convincing. Mila Kunis also does a solid job as Theodora, but without giving too much away, she undergoes a certain transformation about halfway through the movie, and from this point on, Kunis’ performance is much weaker, not quite living up to what we would expect out of the character. Like with Franco, this seems like an unfortunate example of miscasting which really hurts the final act. Her character’s progression, too, is a bit simplistic, especially when compared to the growth we see Oz go through. Often times when great directors make a studio blockbuster like this, their individual voice is lost. That isn’t the case with Sam Raimi, one of my personal heroes in the industry, whose style is fully on display in Great and Powerful. This is very much a Raimi movie, with all of his signature trademarks. Harkening back to his work in horror movies like The Evil Dead and Drag Me to Hell, Oz has plenty of great scares and creepy imagery, terrifying children in the same way the original did. There’s also a great sense of humor throughout, as is true with most of Raimi’s work, with genuinely witty jokes that, thankfully, don’t pander to kids. Like the majority of Sam Raimi’s films, at the end of the day, Oz the Great and Powerful is just fun to watch. While not without its flaws, I’m surprised at how well it turned out. A prequel to The Wizard of Oz seemed like a horrible idea, but Raimi managed to bring us back into this world in a way which reminds us of what came before, but which also brings in a unique take on the mythology. At over two hours, the film is never boring, and it’s incredibly refreshing to see a big budget blockbuster for kids with some genuine wit. While a few of the performances are weak, and some of the characterization could use some work here and there, as far as prequels go, Oz the Great and Powerful really is one of the good ones. March 11, 2013 in All Movies.